History: Astral Magatama is a Necromancer who serves and worships Princess Malice, the ruler of Tartarus as his goddess. He was a heavy practitioner of dark magic and deeply delved and immersed himself into it leading his heart to become hard, dark and cold. Even as a colt he enjoyed killing and dissecting animals before becoming a Dark Mage obsessed with killing them as sacrifices to his dark goddess. He even went as far as to start killing other ponies as sacrifices offering their souls to Princess Malice to give her power. 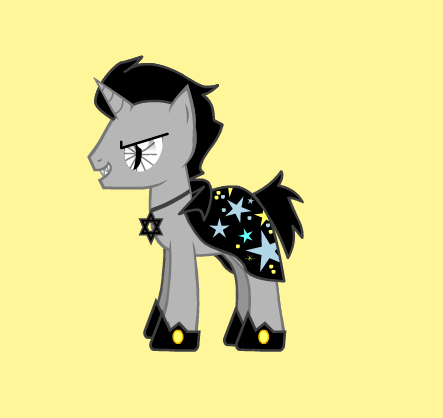 He plans to bring destruction and ruin to Equestria with his mistress and thoroughly despises all Light Magic Users. Master Necromancer: Astral Magatama is a highly skilled Necromancer. He can make zombie thralls at will by making the dead rise from their graves and can call forth the souls of the dead from the afterlife and place them in an uninhabited vessel of his choice. Even inanimate makeshift vessels such as dolls, toys, reconstituted corpses made from their ashes, or clay dummy replicas of their corpses. Dark Magic Master: Astral Magatama is a master of the dark arts and is able to wield their powers to the utmost peak of Unicorn Magic. Master Schemer: Astral is a master of deception, treachery and plots. He often likes to trick others into helping him by lying to them, promising them power among other things only to stab them in the back later. A Black Dark Magic Spell Book: Astral carries a black Grimoire tome with pages filled with different spells, hexes and curses as his primary weapon. Light Magic: Because he is a Dark Magic User, Astral is at a disadvantage against Light Magic Users in battle. Magic Negation: Like any magic user, Astral is left powerless for awhile if he passes through a magic negation field. Reading his description i imagined him looking like a pony rob zombie. Very nice, I just wish there was a way we could avoid pony creator images. Why though? There's hardly any difference between their style and what they would look like in the actual show.